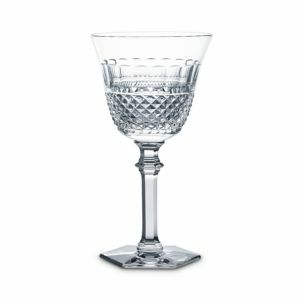 French style glassware to elegant Baccarat Crystal stemware. Handcrafted, hand-painted glass faceted stemware. Four-piece sets. Golden accents. Handcrafted water goblets, wine goblets, and flutes sold separately. Glass with hand-painted 24-kt. gold decoration. Hand-etched glass with 18-karat gold accenting. Handcrafted glass. Lead-free crystal and pewter. Pantograph-etched glass Handcrafted blush glassware with hand-painted 24-kt. gold detail. Each style sold in sets of four. If you are preparing to host a glamorous formal event or a party then our elegant Set of 6 Liqueur Glasses will fill the purpose. Our glass set is made of premium quality, straight from its unique top-quality Gold design that captures everyone attention to its material. This elegant glass set is made durable from genuine quality glass material. Enjoy your expensive wine with this touch of class wine glass set. Our glasses set is ideal to serve quality drinks to your guests. Our glass set is produced top-quality straight from its unique top design that captures everyone attention. It has a lavish gold finish is exquisite to match any functions like birthdays, weddings, office events etc. The tumbler comes with breath-taking classic gold design that will make your table set up appear wonderful. It's ideal size marks it the best gift for your family and friends as well. Our supreme quality product is top crafted from genuine material and you are guaranteed of an incredible long-term easy to maintain and use. Set of four. Glass. Dishwasher safe Floral cameos and feathery fronds add ornate texture to tinted glass. Floral cameos and feathery fronds add ornate texture to tinted glass. Handcrafted water goblet. Approximately 3.625"Dia. x 7"T; holds 7.4 ounces. Mouth-blown, hand-cut crystal. Gilded accents. Hand wash. Made in France. Handcrafted flute. Approximately 2.25"Dia. x 7.5"T; holds 3 ounces. Mouth-blown, hand-cut crystal. Gilded accents. Hand wash. Made in France. Handcrafted water goblet. Approximately 3.75"Dia. x 7.5"T; holds 9.1 ounces. Mouth-blown, hand-cut crystal. Gilded accents. Hand wash. Made in France. Apollo wine glass with gold rim. 6.5"T. Glistening clear crystal with 24-karat gold rim detail. Hand wash. Made in France. Handcrafted crystal stemware. Hand wash. Made in France Crystal water goblet. Approximately 3.75"Dia. x 7.75"T; holds 6.4 ounces. Hand wash. Made in France. Stella champagne flute with gold rim. 2.5"Dia. x 9.1"T. Glistening clear crystal with 24-karat gold rim detail. Hand wash. Made in France. Handcrafted "Bubbles" wine glass from the Les Endiablés collection. Approx. 6.5"H x 3.6"Dia. Hand wash. Made in France. Crystal water goblet. 8.75"T; holds 6.8 ounces. Hand wash. Made in France. Handcrafted water glass. Lead crystal. Handcrafted hock. Lead crystal. Handcrafted hock. Lead crystal. Crystal water goblet. Handcrafted wine glass. Lead crystal. Water goblet designed by Thomas Bastide. Lead crystal. Lead-crystal glasses with red accent. Handcrafted wine glass. Full-lead crystal. Handcrafted stemware. Lead crystal. Made in France. Handcrafted water goblet. Made of full-lead crystal. Optic effect created by fluting on the interior. Handcrafted full-lead crystal from Baccarat. Crafted with slender, graceful silhouettes and sparkling pointed diamond cuts, Baccarat's striking crystal assortment imparts timeless elegance. Made in France Crystal stemware. Made in France. Double old-fashioneds, wine glasses, water glasses, and highballs sold separately in sets of six. Dishwasher and microwave safe. A dimpled honeycomb design reflects the light, the luminosity of a favorite vintage and the bistro-style ambience of La Rochere's Artois Collection. Perfect for everyday dining and special occasions Celebrate everyday dining with the decadence of La Rochere Collection Perigord wine glasses featuring exquisite glasswork in a fluted, goblet design. Borrowing from baroque palatial designs and magnificent garden motifs, the La Rochère Versailles Drinkware Collection features fine French-inspired pressed glass. An ode to France, Fleur de Lys wine goblets bear the country's most enduring symbol. Exceptionally clear and heavy glass is produced in turn-of-the-century molds with traditional seams by Europe's oldest glass factory, la Rochere. The beautiful, embossed pattern on these tumbler and stemmed glasses from La Rochere Collection adds a dashing complement to everyday dining. An ode to France, the Fleur de Lys collection bears the country's most enduring symbol. Exceptionally clear and heavy glasses are produced in turn-of-the-century molds with traditional seams by Europe's oldest glass factory, la Rochere. La Rochere's Napoleon Bee tumblers are classic, sturdy and perfect for everyday use. The bee was chosen by Napoleon during his coronation as his symbol and was used on fabrics, carpets and flags. Both casual and elegant they will compliment any table for serving water, juice or a cocktail. La Rochere drinkware has a stable base, is easy and comfortable to hold and is dishwasher safe. La Rochere's Assorted 3.2-ounce espresso cups are classic and perfect for everyday use. The four assorted designs elegantly compliment each other are comfortable to hold and are dishwasher safe. Steeped in tradition La Rochere is the oldest glass factory in France where the pieces are fired at very high temperatures producing an exceptional quality glass that is crystal clear and durable.